Mitsubishi confirms electric dealers | What Car? 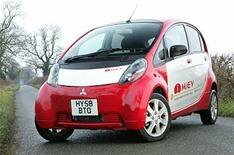 Mitsubishi has confirmed the 13 dealers who will sell its range of electric cars in the UK. These dealers will all have two members of staff who are specially trained to sell the i-MiEV electric car, as well as having a broad understanding of the electric-car market and the companys plans for EVs and plug-in hybrids. Every centre will have demonstrator vehicles, as well as a fully functioning charging bay. However, although only these 13 dealers will sell Mitsubishis electric cars, all of the companys 118 service centres are able to service the cars. The i-MiEV has been available to order from the London Electric Vehicle Centre since August last year, and is now on sale from the full network for 23,990 (including the governments 5000 Plugged-in Car Grant). It is also available under contract hire schemes from 399 per month.